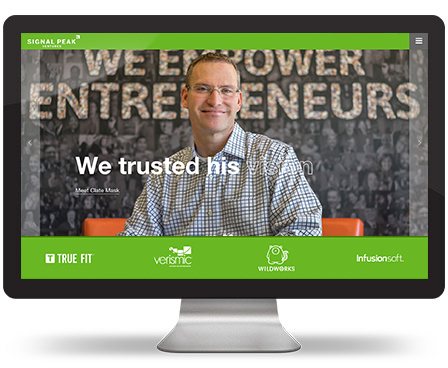 It’s easy to be intimidated by smart guys from Harvard and the like, but the partners at Signal Peak Ventures are personable and professional. We took the venture capital firm through our Perception Branding 5d Process. That’s where we came up with the line on their website that promises “an ego absent interaction”. It’s also how we decided to feature the entrepreneurs who Signal Peak trusts with capital funding. We sent a photographer to the offices of four entrepreneurs to help tell the story of the investment from Signal Peak Ventures. The website we designed and built around these concepts is simple, modern and to the point. Launched earlier this month, the website is responsive on any device. We also helped with a brand refresh and re-designed stationery and business cards.